BWBS Seattle co-hosted a volunteer event in this space last August and we came back to help them again. BWBS Seattle co-hosted a volunteer event in this space last August. 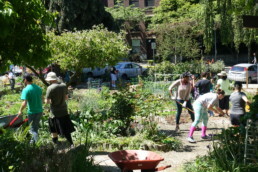 When the owners of the space, Alleycat Acres, needed help preparing the garden for the summer, they invited BWBS back again. BWBS brought 5 volunteers that gathered for an excellent sunny day to help the group fight back weeds, take out the rotten logs of a bridge and clean and level pathways. The volunteers worked hard for about 3.5 hours and the entire garden looked brand new by the end! This park and garden is one of the last green spaces in South Lake Union This park and garden supports the local community, the YMCA and the local community. Thanks to all the volunteers who came out.